FightHype.com takes you back in time to revisit all the action of fights gone by. In this unique series, get a firsthand look at what it's like to experience the physical, mental and emotional ups and downs of a professional prizefight. Find out what the fighters were going through before, during and after the fights as they relive some of the highlights of their most memorable bouts. 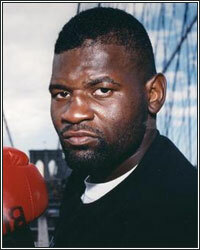 On December 16, 1995, then-undefeated Buster Mathis Jr. faced off against former undisputed heavyweight champion Mike Tyson, who was on the comeback trail after serving a 3-year prison sentence. Check out how Mathis remembers what turned out to be the most definitive point of his career. I lost my father a couple months prior to my fight with Mike. It's kind of funny because before my father passed away, he told me that there were two people that he wanted me to be trained by after he was gone: Kevin Rooney or Joey Fariello. They were very familiar with the Cus D'Amato style of boxing. So I got Joey Fariello to train me for that fight; not only Joey Fariello, but Jose Torres too. So it's like my family was Cus D'Amato, Kevin Rooney, Jose Torres, Joey Fariello and Steve Lott. When I was in New York, I was surrounded by these Cus D'Amato aficionados. It was very good training for the Tyson fight because it was like a family type of thing. That was a great thing. There were two people after my dad passed that was very important in my life and that was Joey Fariello and Jose Torres. We did a lot of conditioning stuff. Joey said, "In facing Mike Tyson, you gotta get past the intimidation factor, and if you get past the intimidation factor, you have half the battle won." So we trained not just the physical part, but the mental part up in camp, and that's one thing that I really liked about training up in New York. The first thing, when I looked at Mike at the pre-fight press conference, I'm looking at him and I remember talking to Joey and saying, "I can't believe this small guy is knocking out people." Mike is very small and very short. When I looked at him, he was a small cat. I just remember my reaction being I could not believe how small he was and how he was knocking out guys much larger than him. So I was a little shocked because that was the first time I had seen him as an adult. Out of all of the fights that I had in my life, Mike Tyson was probably the only fighter that I was not scared of. See, I knew Mike since I was 14 years old. I remember Mike coming to Detroit way before I had my first amateur fight. He used to call my pops and they used to talk about Cus and training in the Catskills. I talked to Mike a few times when he would call the house, so I knew Mike since I was in high school. In the 1st round, I knew Mike like a brother. I used to study Mike all of the time. I used to want to be like a Mike Tyson when I started training and everything. Knowing what he was doing and knowing the system of fighting he came from, I knew how Mike was going to come out and react and stuff like that, so that's how I was able to slip a lot of punches early because I knew what Mike was coming with. I started to touch him a little bit in the 2nd. You know, I'm a fighter and he's a fighter, and Mike is human. After getting through the 1st round, I really started to settle in and start fighting. To me, Mike was just another man. I was his second fight out of prison and we wanted to be his first fight, but Peter got it. My father was pressing me to be his first when Mike Tyson came out. If you look at Mike Tyson and you look at Muhammad Ali, they both had 3-year layoffs. They both came back very rusty, so my father felt it would be a great opportunity to get Mike at his rusty period. You didn't want Mike at the 5th or 6th fight. You wanted Mike at the 1st or 2nd fight back. That was out strategy. If you watch the 3rd round, Mike caught me with a good shot, but I think the ref counted a little fast. I think I would have gotten up and been able to continue. I was dazed and hurt because he caught me with a good punch. I complained to the ref that he started the count at 3 or 4 instead of 1 or 2. The fight with Mike Tyson was my first career loss. And then, on top of that, 10 days later, my trainer, Joey Fariello, passed away and I really lost the spark of fighting because fighting, to me, was more of a family thing more than being about the money. After dad passed and Joey passed, I really didn't like fighting anymore. If Joey was alive, I would have probably fought a lot longer. After he passed away, I just lost my desire to fight. I took a fight in Africa after that and won, and then I lost to Savarese and I just didn't want to fight no more and so that's what I did. I didn't fight anymore after the Savarese fight.